Tis the season of holiday parties, end-of-the year galas and family gatherings. Your social calendar requires a simple yet elegant look that can carry you through it all in style. 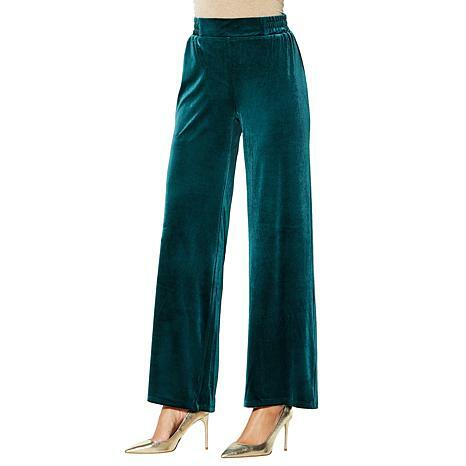 These plush velvet pants feature a figure-flattering, wide palazzo leg and an easy pull-on fit that can be paired with any tee, sweater or blouse to fit the occasion. Gorgeous dressy pant, good length,soft and comfortable material, good fit, great for holiday and special occasions. I purchased 3 colors. Love these pants! Perfect fit - true to size and the fabric is yummy. Gorgeous coloration, hand/drape, and just the right stretch. I'm 5'5" and bought the short inseam and it hits the ground barefoot, nice even with heels. Super value at this price. Not sure I would like these but they are gorgeous! Very flowy and stylish. Fit is true to size and comfortable to wear. Buy these! You will get years of use from a great pant! Comfy, classy, beautiful & true to size.